Yesterday and today I worked on the 2 heads that I drew and wood burned on my exercise piece of berch plywood. First I colored (with water color and color pencils)and painted the heads. The paint has to be translucent. After that I painted the hair and background. Drew in the wet paint with the back of a brush and added some glitter in the same color as the paint. Then stamped on the dry paint using distress ink. 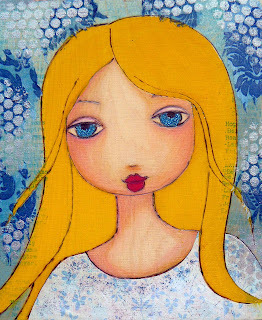 For the girl with the blue background I made her top out of patterned paper and collaged it on the wood using mod podge. 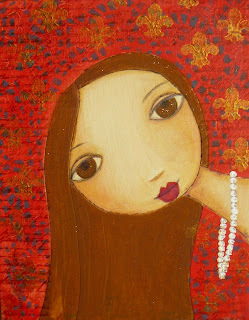 On the red background I used a paper doyle as a mask with plum acrylic paint and a french lily stamp with antique gold metallic acrylic paint. On the blue metallic background I added some small pieces of a paper napkin (only the top layer) using mod podge and added some silver acrylic paint using a piece of mesh (?). I think I'm ready for a complete girl now. Can't wait to start! Ik zou willen dat ik er het geduld voor had. Super! I also have fibromyalgia, CFS & RA, my sister does too and she is a well known artist here in Australia. It helps me to relax too. I love your girls, and I too am enjoying the Suzi workshop/site.